The University of Maryland student paper reports that Ian Hickman won a french fry eating contest held in College Park, MD on Friday. The DMV Eaters team consisting of Ian Hickman, Jay Gorman, Mike Longo and Scotty Phillips won the BGR 15 pound burger eating contest at Taste of DC today. The prize was a trip to Mexico. update Oct 14 K Street Magazine has a blog entry. The Washington City Paper reports that Ian "The Invader" Hickman will compete in a pho eating contest held at VietFest at George Mason University in Fairfax, VA on Saturday. The CompetitiveEat twitter announces the field for the National Spring Break Eating Championship on March 24 in Lake Havasu City, AZ: Ian Hickman, Will Millender, John Rivera, Kevin Ross and Stephanie Torres. The University of Wisconsin's student paper lists Don "Moses" Lerman, "Jammin" Joe LaRue and Chris "The Mad Greek" Abatsas along with defending champion Ian Hickman as expected entrants in Saturday's National Food Court Eating Championship in Madison, WI. update The Daily Page has a longer preview and The Onion's AV Club has a youtube guide to competitive eating. 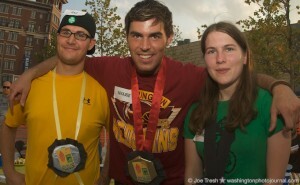 The AICE facebook page reports that Ian Hickman won yesterday's Food Court Eating Championships in Madison, Wisconsin. update The Daily Page has a contest report. Madison.com has a preview of Saturday's National Food Court Eating Championship. WFMZ has an article and video about Ian Hickman winning the contest held at A Taste of Hamburg-er by eating 13 hamburgers in 8 minutes. updateRepublican Herald has a longer article. The commercial for Kentucky Fried Chicken’s new grilled wings has been uploaded to youtube by foodfan263. Ian Hickman, winner of the 2007 Delaware suicide wings contest, is billed as the 2007 wing eating champion and Lucy Bauer is listed as the 2008 champion, apparently based on this video. 2009 Wing Bowl winner John Squibb’s appearance was cut. update I have heard the ad was televised during halftime of tonight’s exhibition NFL game on NBC, I am not sure if the entire country received it. Youtube has a video of Ian Hickman winning the Jake's Burgers qualifier in New Castle Delaware. A video of Ian Hickman's victory in Saturday's contest at the grand opening celebration of Fractured Prune donuts is available. Youtube has a video of the cupcake eating contest held at the grand opening celebration of Cupcakes Today in Fairfax, VA. Ian Hickman, whose retirement was announced in January, won the contest by eating 12 cupcakes in 1:47. James “Big Bess” Besser was the runner-up. AICE News reports that Ian Hickman has retired from competitive eating. Good luck to Ian in his future endeavours. update No mention of Ian’s retirement appears on his myspace page, which has not been logged into since December 28. Ian Hickman’s page on videojug.com. He is listed as the competitive eating expert on that website and has at least 9 interview clips. A video from the pizza eating contest held during the grand opening celebration of Generous George’s Pizza in Herndon, Virginia has been posted to youtube. The caption says that Ian Hickman won the contest by eating 3.5 pizzas in 10 minutes. The NewsAdvance.com reports that Ian Hickman won the Dickey’s pulled pork eating qualifier in Lynchburg, VA. Joshua “Jabber Jaws” Currier was second. Furious Pete to attempt the “Italian Challenge” in Niagara Falls after getting stopped at the US/Canada border crossing update Pete finished the challenge in a record 30 minutes. SuperSizedMeals.com has a gallery from the May 17 Bigger Mac Daddy Burger eating contest. The captions state that Ian Hickman was the winner. The Fairfax Times has an article about Ian Hickman and his quest for a strawberry title. Hickman said he first became interested in becoming a competitive eater after watching actor John Candy eat a huge steak in the movie “The Great Outdoors,” and later consumed his own 64-ounce porterhouse in a Lexington, Ky., steakhouse that offered the meal free to anyone who could finish it in less than 45 minutes. Hickman ate the steak – along with a side and a salad – in only 19 minutes. “That’s when I knew I might have talent as a competitive eater,” he said. Hickman’s 5 minute mark is .23 gallons off Rich Lefevre’s IFOCE chili record of 1.5 gallons in 10 minutes. A video of the curry eating contest between Tomoko Miyake and Ian “the Invader” Hickman in higher definition than youtube videos is available. Some screen captures from the video are linked to the thumbnails above. The high definition enables viewers to determine than Ian is wearing a United Eaters of Pennsylvania hat. Posts © 2005-2019 ojrifkin · Original design by Beccary · Sponsored by Weblogs.us · XHTML · CSS 18 queries. 1.980 seconds.